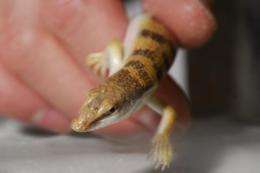 (PhysOrg.com) -- A study published in the July 17 issue of the journal Science details how sandfish -- small lizards with smooth scales -- move rapidly underground through desert sand. 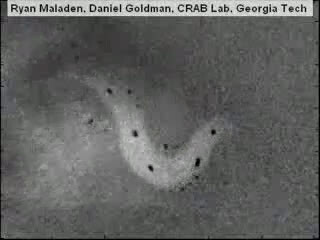 In this first thorough examination of subsurface sandfish locomotion, researchers from the Georgia Institute of Technology found that the animals place their limbs against their sides and create a wave motion with their bodies to propel themselves through granular media. "When started above the surface, the animals dive into the sand within a half second. Once below the surface, they no longer use their limbs for propulsion -- instead, they move forward by propagating a traveling wave down their bodies like a snake," said study leader Daniel Goldman, an assistant professor in Georgia Tech's School of Physics. With funding from the National Science Foundation and the Burroughs Wellcome Fund, the research team used high-speed x-ray imaging to visualize sandfish -- formally called Scincus scincus -- burrowing into and through sand. The team used that information to develop a physics model of the lizard's locomotion. The sandfish used in this study inhabits the Sahara desert in Africa and is approximately four inches long. It uses its long, wedge-shaped snout and countersunk lower jaw to rapidly bury into and swim within sand. The sandfish's body has flattened sides and is covered with smooth shiny scales, its legs are short and sturdy with long and flattened fringed toes and its tail tapers to a fine point. To conduct controlled experiments with the sandfish, Goldman and graduate students Ryan Maladen, Yang Ding and Chen Li built a seven-inch by eight-inch by four-inch-deep glass bead-filled container with tiny holes in the bottom through which air could be blown. The air pulses elevated the beads and caused them to settle into a loosely packed solid state. Repeated pulses of air compacted the material, allowing the researchers to closely control the density of the material. Since a sandfish might encounter and need to move through different densities of sand in the desert, the researchers tested whether sandfish locomotion changed when burrowing through media with volume fractions of 58 and 62 percent -- typical values for desert sand. "Since loosely packed media is easier to push through and closely packed is harder to push through, we thought there should be some difference in the sandfish's locomotion," said Goldman. "But the results surprised us because the density of the granular media did not affect how the sandfish traveled through the sand; it was always the same undulatory wavelike pattern." For a given wave frequency, the swimming speed depended only on the frequency of the wave and not on the density. Unexpectedly though, the animals could swim a bit faster in closely packed material by using a higher frequency range. The team also varied the diameter of the glass beads, but still observed similar wavelike motion. By tracking the sandfish in the x-ray images as it swam through the glass beads, Goldman was able to characterize the sandfish's motion -- called its kinematics -- as the form of a single-period sinusoidal wave that traveled from the head to the tail. "The large amplitude waves over the entire body are unlike the kinematics of other undulatory swimming organisms that are the same size as the sandfish, like eels, which propagate waves that start with a small amplitude that gets larger toward the tail," explained Goldman. After collecting the experimental data, Goldman's team developed a physics model to predict the speed at which sandfish swim through sand. The model was inspired by the resistive force theory, which allowed the researchers to partition the body of the sandfish into segments, each of which generated thrust and experienced drag when moving through the granular environment. "When you balance the thrust and drag, you get motion at some velocity, but we needed to determine the forces on the animal segments because we don't have the appropriate equations for drag force during movement through granular media," explained Goldman. Video showing markers for tracking sandfish limbs. To establish these equations, the researchers measured the granular thrust and drag forces on a small stainless steel cylindrical rod, thus allowing them to predict the wave efficiency and optimal kinematics. They found that the faster the sandfish propagate the wave, the faster they move forward through granular media -- up to speeds of six inches per second. This speed allows the animal to escape predators, the heat of the desert surface and quickly swim to ambush surface prey they detect from vibrations. "The results demonstrate that burrowing and swimming in complex media like sand can have intricacy similar to that of movement in air or water, and that organisms can exploit the solid and fluid-like properties of these media to move effectively within them," noted Goldman. In addition to having a biological impact, this study's results also have ecological significance, according to Goldman. Understanding the mechanics of subsurface movement could reveal how the actions of small burrowing organisms like worms, scorpions, snakes and lizards can transform landscapes by their burrowing actions. 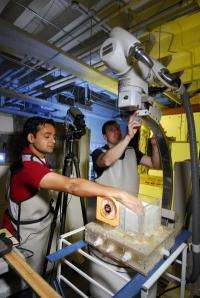 This research may also help engineers build sandfish-like robots that can travel through complex environments. "If something nasty was buried in unconsolidated material, such as rubble, debris or sand, and you wanted to find it, you would need a device that could scamper on the surface, but also swim underneath the surface," Goldman said. "Since our work aims to fundamentally understand how the best animals in nature move in these complex unstructured environments, it could be very valuable information for this type of research."